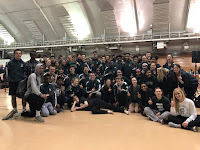 Tuesday night's dual was wet but the athlete's who mentally got past the fact it was raining out enjoyed a beautiful night of track & field with decent temperature and little wind. It was great to see so many people step up and compete as there were over 70 PRs set by JMM athletes at the dual. Unfortunately the boys lost a close dual to Sun Prairie 78 to 68 and although the girls lost 59 to 87 they scored very well against the defending conference champions. Both programs continued to improve across the board and look forward to returning to action later this week for more season highlights. The girls were led by event champions: Phibi M in the 100m hurdles (17.2) & 300m hurdles (54.0), Sydney S in the high jump (4' 8") & triple jump (31' 5.25"), and Holly H in the discus (93' 7). Other notable performances on the night go to Marcella V taking 2nd in the 100m dash in a PR of 13.7, Meghan S placing 2nd in the 1600m run with a PR of 5:30.1, Amelia F taking 3rd in the 3200m run in a PR of 12:19.2, Kayla G clearing 9' 0" in the pole vault for 2nd place, and Holly A PRing in the discus to place 3rd with a toss of 79' 8". The boys were led by event champions: 4 x 800m relay (9:00.8), Micah P in the 110m hurdles (16.3) & triple jump (42' 2.75"), Daurice F in the 300m hurdles (40.8) & long jump (20' 6.5"), Darrion M in the high jump (5' 4"), Luke V in the 800m run (2:09.4), and the 4x400m relay (3:49.3). Other notable performances included a freshman school record in the 4x800 by Luke V, Casey GT, Jonas B, & Ty B running a time of 9:08.3, Jared B running 11.3 for a new PR in the 100m dash placing 3rd, Josh B running 2:09.7 a PR for 2nd in the 800m run, Jake A taking 2nd in the 200m dash in 23.7, Ryan B throwing a PR of 45' 9" in the shot put for 2nd place, and Sean B throwing a PR in the discus of 115' 10". Spring Is Here or Is It?